‘Citizenship consists in the service of the country’, words lived for and dwelt on by eminent visionaries like Pandit Jawaharlal Nehru, Smt. Indira Gandhi and Sri. Rajeev Gandhi, who devoted their entire lives towards the progress and development of our nation and its people. Into this family of self-less patriots, Sri. Rahul Gandhi was born on June 19, 1970 at Delhi. A dynamic, thoughtful, benevolent and vibrant personality since his student days, he holds an M.Phil degree in Development Economics from Trinity College, Cambridge University. Following in the footsteps of his family, Sri. Rahul Gandhi entered public life in the year 2004 representing Ameti in the Lok Sabha. Since then it has been a life dedicated to the service of the nation and its people. He was elected as the General Secretary of the Congress Party in the year 2007. Sri. 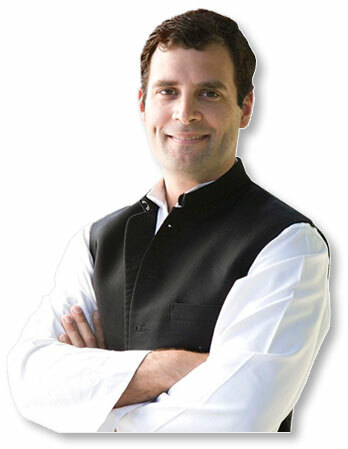 Rahul Gandhi is a youth icon, a person who appeals to both the younger and older generation. He is the leader of the Indian Youth Congress and the National Students Union of India. He was elected as the Vice President of Congress Party on 19th January 2013. Why is our youth angry? Why are they out on the street? They are angry because they are alienated and excluded from the political class. They watch from the sidelines as the powerful drive around in their lal battis. Why are the women suffering? Because their voice is being trampled upon by people with arbitrary power over their lives. Why are the poor confined to powerlessness and poverty? Because decisions regarding their lives and the services they need are decided by people faraway answerable to them only in theory. Until we start to respect and empower people for their knowledge and understanding, we can’t change anything in this country. All our public systems – administration, justice, education, political systems – all of them are designed to keep people with knowledge out. They are all closed systems. Their design promotes mediocrity and mediocrity dominates discussion while the voices of insight and thought are crushed by the loudness of those who possess neither understanding nor compassion. Success in these systems does not come through building, it comes by excluding. It comes not by pushing people forward, but by holding people back. Everyday initiative is killed to maintain the status quo. We do not praise our colleagues or look at their strengths. And all of us, every single one of us does it. We won’t praise other people. We will ask them “bhaiya, what is your weakness?” We only look at ways to neutralize them. And every single day all of us are faced with the hypocrisy of this system. We all see it. And then we pretend that it is not there. People who are corrupt stand up and talk about eradicating corruption; and then people who disrespect women everyday of their lives talk about women rights. Until we start to respect and empower people for their knowledge, for their understanding, we are never going to change this country. We need the aam aadmi to participate in our politics. Because even as I speak their future is being decided in closed rooms. There is a young and impatient India and it is demanding a greater voice in the nation’s future. Let me tell you that they are not going to watch silently. Our priorities are clear. The time has come to question the centralized, unresponsive and unaccountable systems of decision-making in governance, administration and politics. The answer is not that people say we need to run the system better. The answer is not in running these systems better. The answer is to completely transforming these systems. Yet, I am optimistic. I am optimistic because we have already put the building blocks of this revolution in place. And to a big degree I would like to thank the Congress President, the Prime Minister and the Congress Party for putting these building blocks in place. Let me tell you what these building blocks are. First of all, India is more connected today than it has ever been. We have the networks of roads, information, communication, people and media for new ideas to emerge, develop and take flight. It is no longer possible to limit an idea whose time has come. Aadhar gives us an unprecedented mechanism to recognize the unique journey of aspiration of every single Indian no matter where he is. Direct cash transfer is going to allow us to respond to these dreams with an empowering delivering system. My father used to speak about 15 paisa to the rupee reaching the people and we today are preparing the system that is going to answer that question. We are going to answer that question. And 99% of our people’s money can go to them. It is a revolution that no other country has done. And we are preparing that revolution. We prepare the revolution and our opponents say that we are bribing the country. Giving the people their due is now called bribing the country. They say it because they are scared. They understand what Aadhar can do. They understand what cash transfers can do. And most important, they understand what people in the Congress Party, what the thinking in the Congress Party can do. Panchayati Raj and the women’s self-help movement have given us the platform to transform our democracy. The balance of power in national decision-making must shift away from Delhi and the state capitals to the last Panchayat and Municipal Ward. The Congress Party must continue to wage a relentless battle to overcome social prejudice and discrimination against women, dalits, minorities and tribals. I am optimistic because of the buildings blocks. But I am most optimistic and excited because I see the energy, the passion and capability of our youth. We need to respond to their urgent demand for jobs, now. Our institutions of learning and training must respond, first and foremost, to preparing youth at scale for the best jobs in the world. Equally, decisions that matter to creating jobs need to be further liberated from irrational red-tape and outdated laws so that the tremendous energy of India’s youth will be fully unleashed. This morning I got up at 4 a.m. and went to the balcony. I thought now you have a big responsibility in front of you and people are standing behind you, people are standing on your side. It was dark and it was cold. I decided I was not going to tell you only what you wanted to hear. I decided I was going to tell you a little bit about what I feel. I want to tell you about Hope and I want to tell you about Power. When I was a little boy I loved to play badminton. I loved it because it gave me balance in a complicated world. I was taught how to play, in my grandmother’s house, by two of the policemen who protected my grandmother. They were my friends. Then one day they killed my grandmother and took away the balance in my life. I felt pain like I had never felt before. My father was in Bengal and he came back. The hospital was dark, green and dirty. There was a huge screaming crowd outside as I entered. It was the first time in my life that I saw my father crying. He was the bravest person I knew and yet I saw him cry. I could see that he too was broken. In those days our country was not what it is today. In the eyes of the world we had nothing. We were seen as worthless. We didn’t have money; we didn’t have cars. Everybody said that we were a poor country. Nobody thought about us. That same evening I saw my father address the nation on television. I knew, like me, he was broken inside. I knew, like me, he was terrified of what lay in front of him. Then as he spoke on that dark night I felt a small glimmer of hope. It was like a small ray of light in a dark sky. I can still remember what it felt like. The next day I realized that many people had seen it too. Today as I look back – I have a political career of 8 years and I am 42 years old – I can see that it was that small ray of hope in the darkness that helped change India into what it is today. Without hope you cannot achieve anything. You can have plans ,you can have ideas, but unless you have hope, you cannot change things; you cannot move things the size of India. Now I want to talk to you about Power. Last night everyone congratulated me. Many of you came and hugged me and congratulated me. Everybody congratulated me. But last night my mother came to my room and she sat with me and she cried. Why did she cry? She cried because she understands that the power so many seek is actually a poison. She can see it because of what it does to the people around her and the people they love. But most importantly she can see it because she is not attached to it. The only antidote to this poison is for all of us to see it for what it really is and not become attached to it. We should not chase power for the attributes of power. We should only use it to empower the voiceless. In our work – it is my mother’s experience of a lifetime, it is my experience of 8 years and I am sure many of you here who deal with power everyday and understand what I am saying and realize the positive and the negative. We mustn’t forget that there is negative and that you have to be very careful when you are going to administer power and when you use power. Today India is not like it was in 1984. We are no longer seen as worthless. Today the entire world is courting us. Today we are the future. And as I said before, nations are not built on schemes and plans. They are raised on a foundation of hope. I am standing here because I believe that the Congress Party is a symbol of this hope and has the potential to embody it. I’d like to end again by saying that for me the Congress Party is now my life. The people of India are my life. And I will fight for the people of India and for this Party. I will fight with everything I have. And I invite all of you to stand up and take on this fight.